The original PanaVise set a new standard for “work holding devices.” It’s leaps and bounds more versatile than the common bench vise. What separates it from the rest is its split-ball mechanism, which allows the head to tilt 180 degrees from vertical, turn 360 degrees on its axis, and rotate 360 degrees within the mount — all with the release of a single knob. I use my original PanaVise every day. I adore it — so much so that when I found a semi-local dealer, I bought another. Pictured above is my new rig: the model 376 “extra-wide-opening head” mated with a 305 “low-profile base.” I could’ve bought just the head, I suppose, and used it with my existing base. But having two complete vises opens all sorts of doors in terms of bench work. Read on past the jump for some serious hands-on experience with it — and lots of pictures. What might not be obvious from the pictures is how simple PanaVise’s mechanism really is. There are only two controls — the crank moves the jaws, and the knob does everything else. By simply loosening the friction force on the split-ball base, you can tilt the head horizontally, swivel it about its axis, and rotate it relative to the base. One twist of the knob locks it down for work. If you’re often frustrated by the multitude of sloppy joints in a “helping hands” alligator-clip stand, you’ll definitely appreciate the simplicity of one-twist adjustment! In these pictures, you can see my other rig, a model 366 “wide-opening head” on another 305 Low-Profile Base, bolted to the (surprisingly heavy) 308 “weighted base mount.” The third image shows the 376 with its jaws turned around, giving it the eponymous “extra-wide” opening. When I got my 366/305/308 set (used on eBay), I noticed that the jaw crank handle didn’t spin as easily as I’d like. I chalked it up to gunk in the swivel and forgot about it. When I unpacked my 376 and observed the same behavior, I looked more closely. It turns out that the vinyl cap on the handle is about 2mm too long and interferes with the crank’s motion. Ten seconds with a knife solved that problem, on both units. One nice thing about the extra-wide head is that it opens and closes faster than the plain wide head because the shaft has two opposing threads and both jaws move when I turn the handle. In the next photo you’ll see my spare Toughbook CF-17 undergoing surgery. The audio jack assembly and gasket are visible to the right of the vise base. (Yes, those are Harbor Freight screwdrivers in the orange tray. They’re not bad!) When they say the extra-wide head opens to nine inches, they actually mean nine and a smidge. That’s a good thing, too! You can see that the jaws are almost at the end of their travel holding the Toughbook. I included the third photo as an example of why having a second vice is twice as nice. It’s a bit crowded in there, because both of my bases are low-profile. I don’t plan to bolt either one down, so keeping the low center of gravity was important to me. If I were building a permanent work station, I might opt for the standard base which leaves more working room below the head. Also note that the 376 head’s jaws have been turned back around to grab the Mini-Maglite. I keep a set of little alligator-clip “helping hands” around for general electronics work, especially soldering. But the PanaVise fills the same need — for larger stuff. It’s the first thing I reach for when my work won’t hold still. It’s incredibly handy, and has never let me down. PanaVise heads go for $20 to $40 depending on the model you choose, and bases go for $20 to $30. They’re made in the US, and replacement jaw pads — the only part not covered under PanaVise’s warranty — are readily available. I consider them heirloom tools. Having just blown my play money for a while, I got to wondering whether there were cheap knockoff Panavises and whether they were any good. Sure enough, Harbor Freight makes one, and it’s fifteen bucks — currently on sale for ten plus seven shipping. It’s a shame none of my local stores carry it, because I’d like to do a side-by-side comparison. As a side note, the HF version is available only with a vacuum base; That means no interchangeability — and no love for beat-up benchtops. For those keeping score of movie-biz weirdness, this is known in my trade as a ‘mag clamp’. 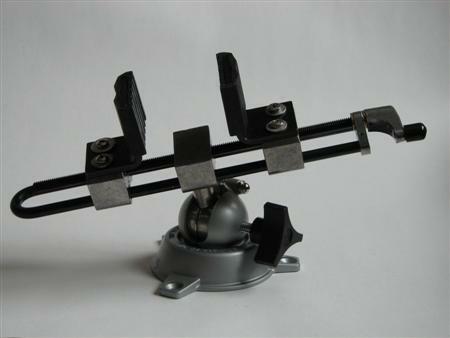 The clamp part is removed from the base and fitted with a 5/8″ pin, which can be grabbed by a grip (or gobo) head, removed from the c-stand. The clamp is tightened to the back of a film magazine (at the back of the camera) when mounting camera on ferarri, motorcycle, blimp, helicopter, donkey, etc.. The pin is grabbed by at least two grip arms (to triangulate to other solidly mounted clamps) and the whole arrangement prevents camera shake.